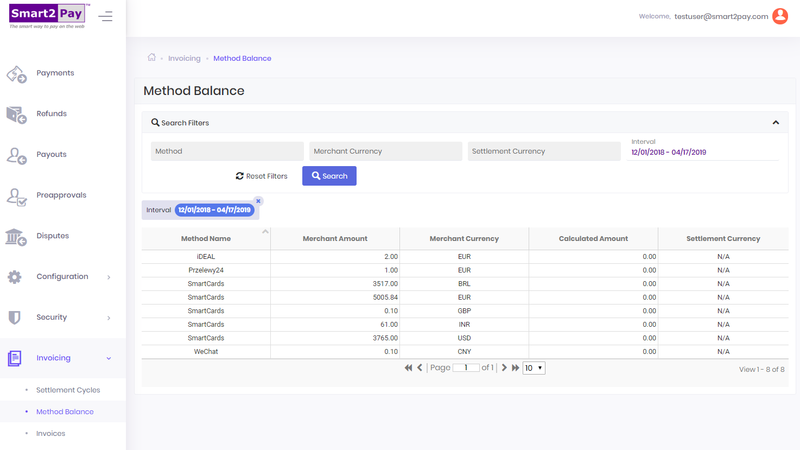 By accessing the Method Balance tab, you can see for each method the converted balance from the transaction (merchant) currency to the settlement currency in the calculated amount field. Please note that the converted balance value from the calculated amount field is an approximate value based on the current exchange rate. This means, you have the possibility to see the currency and the amount for a specific method in which you have initiated the payment and the amount for that specific method in the settlement currency. When you access the Method Balance tab, the Search Filters section is expanded. In order to collapse it just click the arrow on the right of the screen. : the currency in which the settlement will be made.